Hand held battery powered cloth cutting machine with large 80mm round knife blade, carbide tipped bottom blade and special extra thin knife standard. 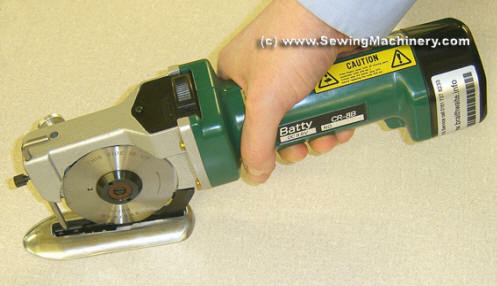 Easy-to-operate hand cutter for effortless precision cutting. Operating from a Hitachi battery pack with no power lead to get in the way. Hitachi battery pack & charger. Designed to help reduce operator fatigue and increase production when compared to hand use of large cutting shears. Spare Blades available from our parts dept.